A type of neuromodulator, BOTOX® Cosmetic works by temporarily suspending movement in the muscles that can form facial creases. Dr. Sepehr says that a skilled and experienced injector understands how to target specific areas of the face to reduce wrinkles while maintaining the patient’s ability to show a full range of emotion. A natural-looking result is a primary concern for many, he adds, and the injection technique should be modified to suit the unique anatomic needs and cosmetic goals of the male patient. Part of what makes “Brotox” so popular, Dr. Sepehr suggests, is that it is a versatile, temporary anti-aging treatment. He says patients can try out the effects, which last approximately three to six months, and then decide if they want to continue with regular injections. 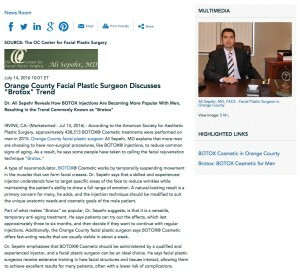 Additionally, the Orange County facial plastic surgeon says BOTOX® Cosmetic offers fast-acting results that are usually visible in about a week. Dr. Sepehr emphasizes that BOTOX® Cosmetic should be administered by a qualified and experienced injector, and a facial plastic surgeon can be an ideal choice. He says facial plastic surgeons receive extensive training in how facial structures and tissues interact, allowing them to achieve excellent results for many patients, often with a lower risk of complications. Educated at the University of California, Los Angeles and the University of California, Irvine, Dr. Ali Sepehr is a board certified and fellowship-trained facial plastic surgeon. He is the recipient of numerous honors, and he has been named one of “America’s Top Physicians.” Dr. Sepehr was also listed in “Who’s Who in America.” In addition to working as an instructor at UCLA School of Medicine, Dr. Sepehr is an active member of several medical associations, including the American Academy of Facial Plastic and Reconstructive Surgery, the American Academy of Otolaryngology, and the American College of Physicians. He is available for interview upon request.